Sold by dbbargains and Fulfilled by Amazon. Gift-wrap available. Descendent of the first Timex Ironman watches introduced in 1986, the Timex Ironman Rugged 30 watch builds on the iconic performance brand’s heritage. The Ironman Rugged 30 is your dependable companion for your morning runs, laps in the pool, the job site, and the office. 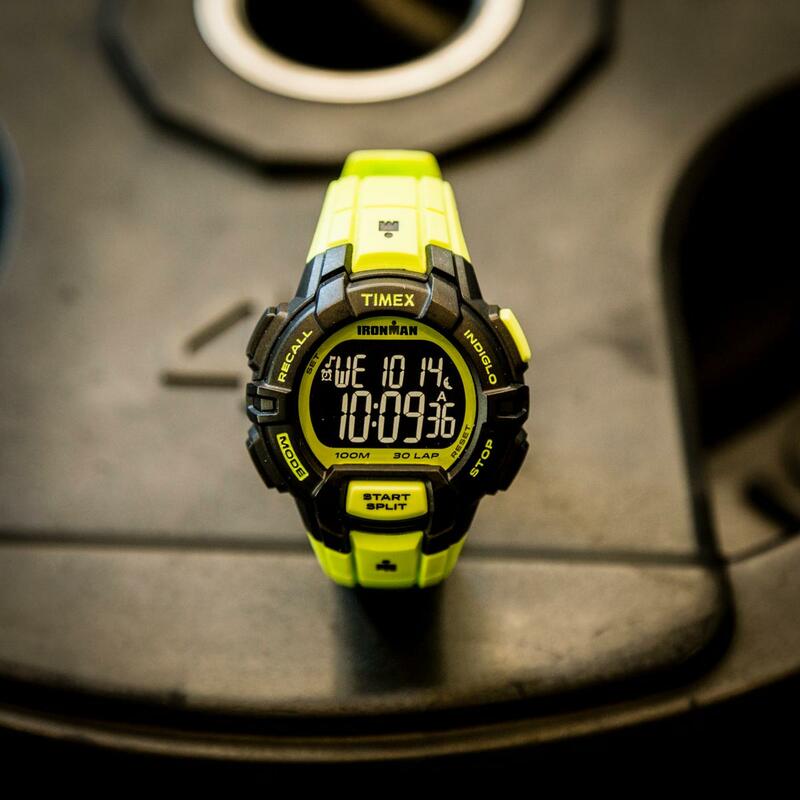 Ironman Rugged 30 features a 100-hour chronograph with lap and split times, capable of counting up to 99 laps. Its distinctive 30-lap memory recall enables you to effortlessly review your workout. You can even recall lap or split times on the fly. Every Rugged 30 comes equipped with a 24-hour countdown timer complete with stop and repeat functions. Occasion mode enables you to set up to 15 reminders for events like birthdays, anniversaries, holidays, or appointments. Meanwhile, the alarm mode gives you three individually customized settings with daily, weekday, weekend, and weekly options. If you travel regularly, your Rugged 30 can be set with up to two time zones. You can streamline the interface by turning off unused menu items. If necessary, you can always reactivate those menu items later. On-screen prompts make setting your watch easy, even more so with forward or backward setting capability. The pusher located on the watch face is easy to access while you are active. 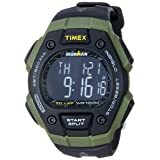 Each Timex Ironman Rugged 30 is equipped with Indiglo night-light, a low-powered electroluminescence, providing easy readability in the dark. The Night-Mode feature enables you to activate the Indiglo function with any button simplifying operability in the dark. 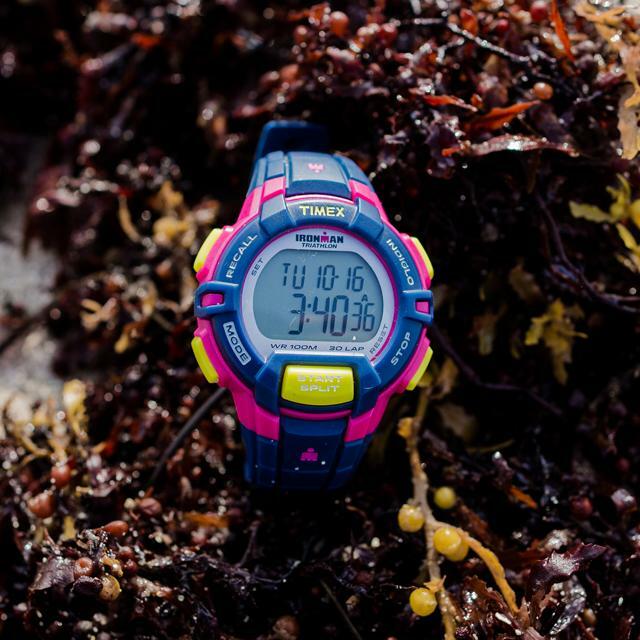 Constructed from durable and lightweight resin, you will barely notice it’s on your wrist. For added durability, all styles are water-resistant up to 100 meters (330 feet). 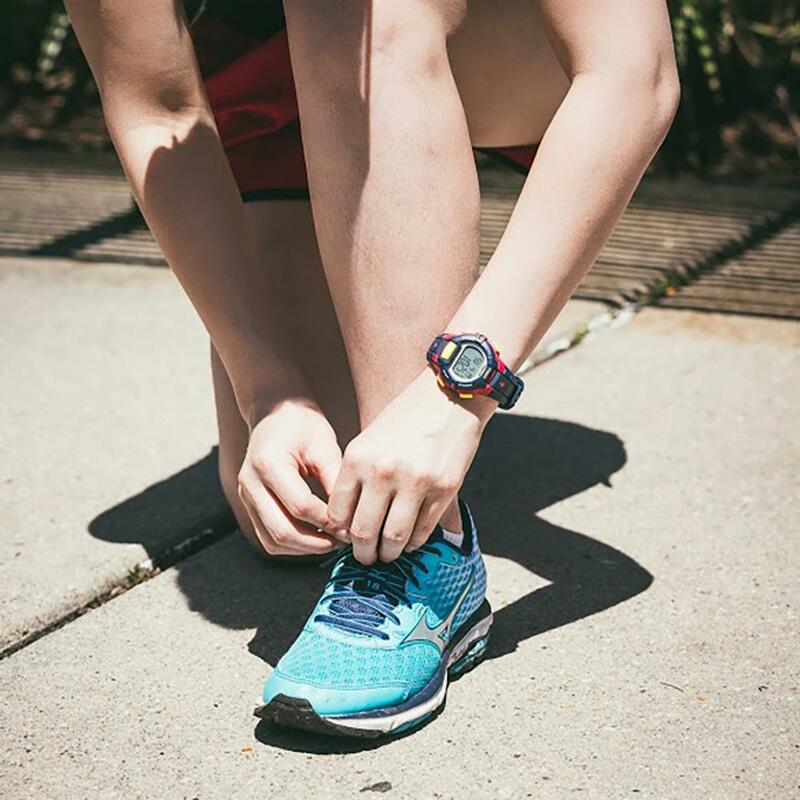 Featuring an array of bold colors and comfortable resin and nylon Fast Wrap straps in full and mid sizes, you can find the right combination that fits your sport and style without sacrificing any of the Rugged 30’s many features. There are 640 muscles in the human body and Rugged 30 is designed to fit, flex and wear like the 641st. 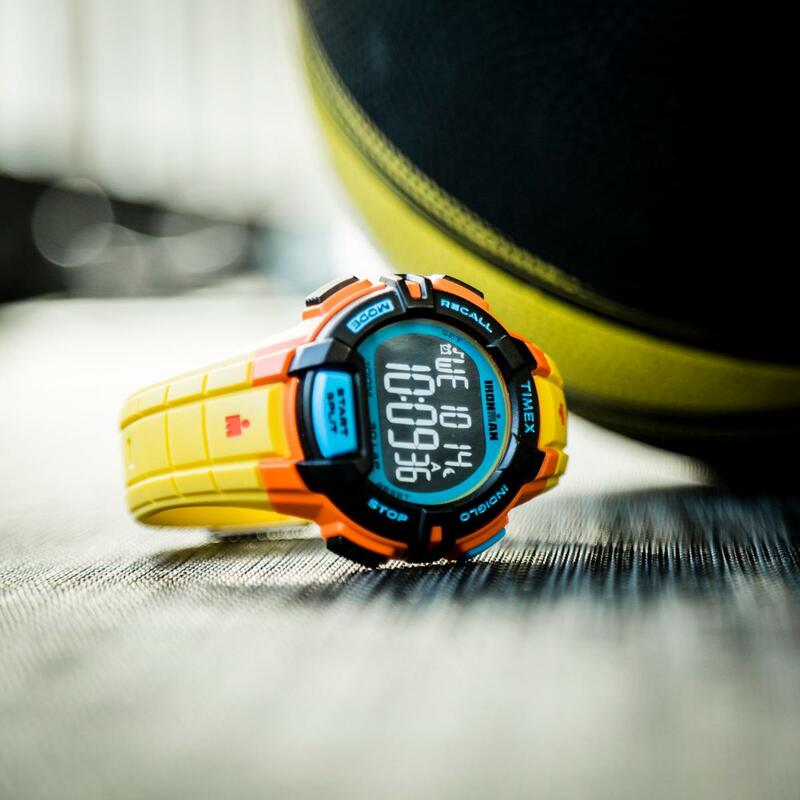 Workout-ready with a digital stopwatch, timers and alarms, it’s tough enough for ten more “reps” and the rest of your day. 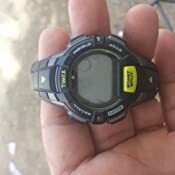 I bought this as a running watch. 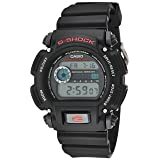 I already have a classic Casio G-Shock (DW5600E). They are simply different. This is fantastic for running. 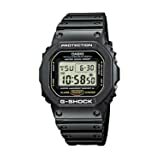 It is good for general outdoor wear as well, but it is not as suitable for the really rugged stuff for which the G-Shock is made. 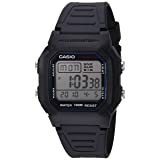 The buttons on this are easy to press and can be pressed accidentally, while the Casio buttons can be hard to press but will not be pressed accidentally. I believe that makes this less waterproof in practice as well. The 3 alarms of the Timex is helpful at times. 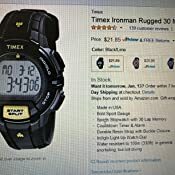 This is listed as a women's watch, though the case is only slightly smaller than other Timex Ironman watches. The band is smaller, but my wrists are not large, and I am nowhere near max on the band. I do not like huge watches, so this is great. I prefer this over the G-Shock for anything that does not need the extra ruggedness. 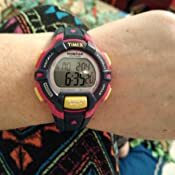 I have been using this Timex watch for years. 3. 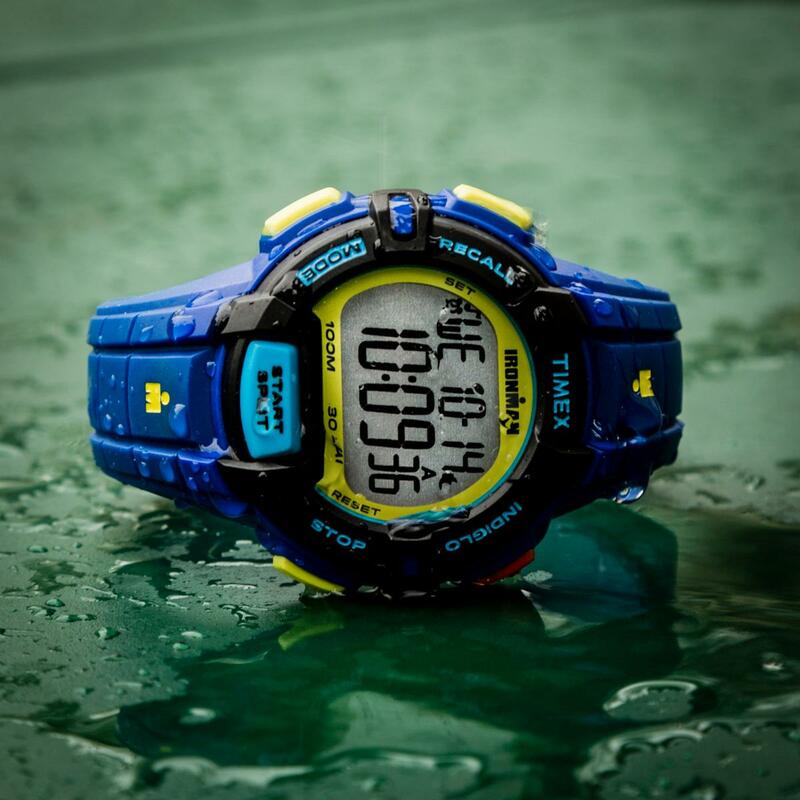 I mostly use the Chrono for my swimming laps. It shows per lap and per total workout time information. Push a button will turn the light on in the dark. Also this feature is also very good for keeping track of your time when doing other tasks. Cons: the light might stop working after a while, this is like a chance problem. I have several Timex watches. Some of them do not have this issue, some have. So I have to buy a new one after months with the watch price relatively affordable. I would recommend to a friend who needs simplicity, not wanting fancier smart watch feature. 4.0 out of 5 starsKeep coming back to the ironman. Edited to say, it's been slightly under a year and the indiglo backlight quit working. Battery is still good. So taking a star back. What can I say? 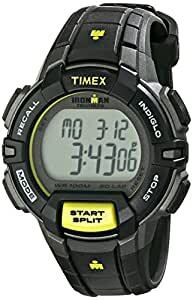 I keep going back to the Timex Ironman. The only downside to them is that I take them off a lot for work and eventually the rubber strap cracks. 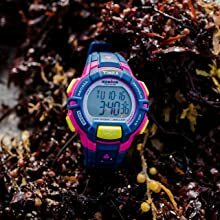 But I tried the Velcro strapped timex expedition and the features weren't as nice and the Velcro strap caught on things and was more annoying. I like that they're coming in more color choices. I love this watch. Perfect size, great for the nursing field, wash my hands all day long and it holds up. Some say water resistant or waterproof and the water seeps in with all the hand washing I do, but not this watch. Timex is just a quality watch. Not too big, but big enough to be able to see. Super fast shipping, great packaging. All in all, extremely happy with this purchase! I bought this for my daughter who is in track, and love the quality. These are great watches. It's a little quirky to understand exactly how to set it all, but there's a nice online manual and you figure it out pretty quick. I bought the bigger one for my son too, both kids like them a lot. 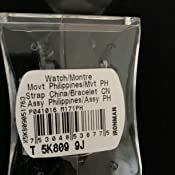 5.0 out of 5 starsLove this watch!! Love it! Time, date, and day on face. Fits great! Have showered everyday wearing it with no problems. Would definitely reccomend for sports minded people looking for a watch that can take a beating. I am tough on watches and this one is meeting all my expectations!! 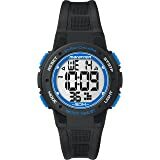 I got this as my everyday sport watch. It's every thing I was expecting. The instructions do not really explain how to set the watch, but it's very simple to use. I had no problem setting it up. I am not sure about how water resistant it is. 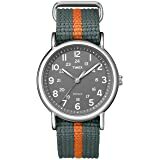 I would highly recommend this watch.